Spring porcinis are one of our favorite mushrooms to hunt. After a long Colorado winter we get to find BIG mushrooms in Oregon! We have experienced two lean porcini years in CO and are anxious to restock our pantry with what is arguably our favorite eating mushroom. 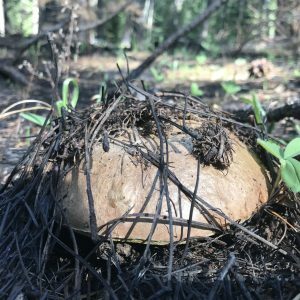 The spring king in Oregon (boletus rex-veris) is different than Colorado’s king bolete (boletus edulis) and we are certainly no experts at finding it. 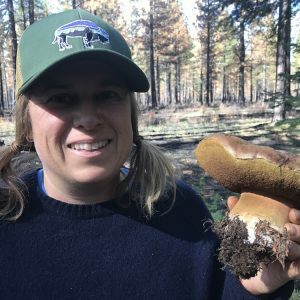 We found our first boletus rex-veris, a single one, three years ago and last year looked for two days during our Oregon trip and only found about a dozen. This year we got the bug decided to spend a few extra days, in-between burns, hunting and learning about Oregon’s spring kings. The spring kings tend to pop up in the same places every year… so finding those spots is critical. Kings come up after the morels (or at least the black morels) and if it is a good year, you might find them both at the same time. This year we were lucky, we got to hook up with our friends Joseph and Elika — these two are truly modern foragers! They shared a lot of great porcini tips during the few days we hunted together and they taught us how to locate the right terrain, where to look and how to pick them. Right on the seams where the riparian area along a creek turned into a more open forest. Notably, there were always Grand Firs about with both big old ones and clumps of little ones. Likely spots were along trails and roads or old roads, skid roads and cuts. 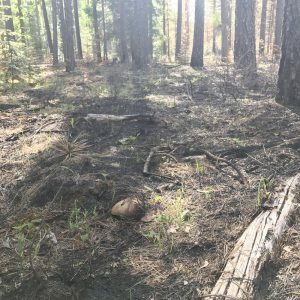 Areas that looked like they had been logged in the last 10 years were good places to look around fresh skid tracks or in older cuts in the small trees that were growing up where the logging roads were going native. Again, we always focused on grand firs… we looked hard underneath these trees in the duff of their needle drops. When we found one, we looked really carefully around for more “mushrumps.” We found many beautiful buttons (and many even smaller we left behind) by exploring near mushrooms. getting on our hands and knees and exploring the duff with our fingers. Often there were brother and sister mushrooms hiding nearby, practically invisible. The porcinis we found were largely bug free… but, bugs like this mushroom – we got lucky. One tip is to cut out any bug infestations before putting into the bag. Then, cool the mushrooms quickly (refrigerate or use a cooler) to slow down the bug growth, cut them up and begin drying ASAP. Otherwise, given time and warmth, the little worms that crawl through the flesh and eat will spread and destroy your bounty. The yellow pores underneath the mushroom were actually pretty tasty. We often get rid of these when cleaning our porcinis. But, Joseph left those on the mushrooms and grilled them over the fire (after tossing with olive oil and shallots) and WOW! The pores were rich and really reminded us of pork belly fat. They had a great texture and flavor. One of the most exciting parts of our hunt happened after we wandered into a recent prescribed burn. While we were camping the fire crews were burning nearby parcels. We skirted around the edges of these parcels, where the burns would border a creek/riparian area. This was the last day of our trip, and we discovered several beautiful, big, bug-free morels bursting from the burned soil. They stuck out like sore thumbs! In the course of a hour or two we found about a dozen nice ones that had survived the fire. 2017 ended up being a great spring porcini year for us – we picked close to 20 lbs of bug-free ‘cini in a few days. Half of the harvest we sliced up and dried in our hanging camp dryer – these went into a proper dehydrator eventually. The other half we sautéed and froze in ziplock bags using our little camper propane-powered freezer. We have never preserved boletes this way, but, initial testing is thumbs-up. They thaw nicely and are easy to add to whatever we are cooking. Of course we also ate as many as we could while we were camping. Last year we didn’t do as well. While we were hunting during the same dates at the very end of May, it also seemed like a “late” spring which meant the Porcinis were just starting. The big flushes were yet to come. There are two advantages to catching the spring porcini early: finding morels at the same time and not competing directly with the commercial pickers, who were just starting to arrive. The surrounding forest – see the porcini? 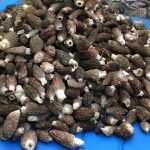 First day results – it was still a bit moist and we were finding morels. If you had a permit, check out your maps. All the areas close to Metolius streams are closed to picking. Tom, We definitely had a permit and a map. 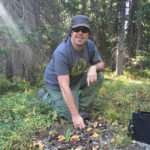 Your comment seems way off, looking at the map, quadrant 27,34,35,36,25 and 26 all have some non-picking zones… notably in the Metolius Research Natural Area. I uploaded a picture of the map to the blog post above, so others can see it too – the white is off limits and the Green is OK. For everyone else: when you buy your permit, they give you a map that shows where you can pick and where you cannot pick (at least in the Deschutes forest, other forests are different). Definitely pay attention to those maps! Typically, the quadrants that are close to picking are some sort of official area (like a research area) or are largely private property areas. (of course wilderness too).